When I posted a photo of my recently-used mini Makeup Eraser on Instagram and Snapchat a few days ago, I was a little surprised by how many people commented about how much they love their own full-sized Eraser. Ranging from a local drag queen to a high school friend, they all proclaimed that it was one of their favorite products and a staple in their collection. 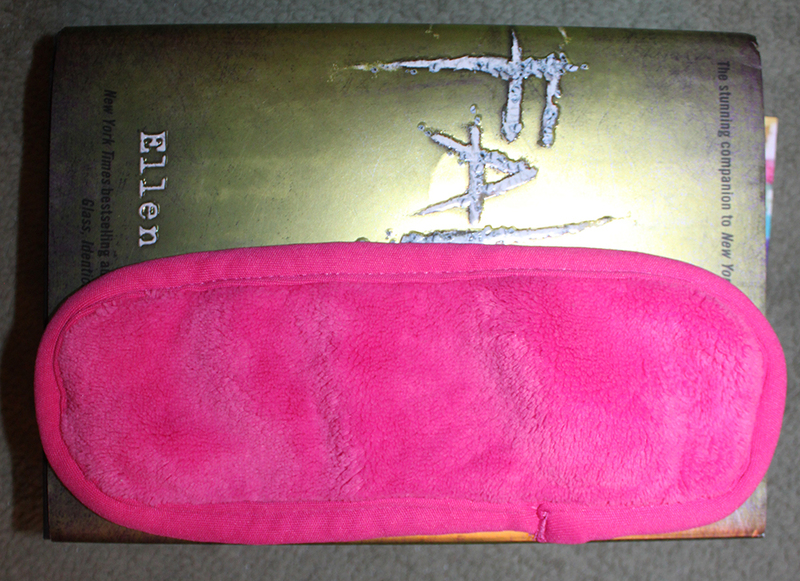 I was surprised, you see, because I didn't expect much from this hot pink oddity. Part of that is because I'm deeply committed to removing my makeup with oil, and part of that is because I remember cringing at a friend who spent 5 minutes scrubbing off long-wearing foundation with a rough towel. It turned her face beet red and never fully removed the product, which resulted in some skin problems on her end. "A towel," I have long declared, "cannot remove all of your makeup." But after re-acquainting myself with "no foundation looks" this past year, I've gotten in to the habit of sometimes wearing a very bare-bones list of products: brow pencil, mascara, concealer where needed, lip balm. And on those days, it feels wasteful and excessive to soak two Shiseido cottons in baby oil and run through my usual makeup removal routine. So when I noticed a mini Makeup Eraser in a $17 Sephora favorites kit that included several other items I was interested in, I decided to give it a shot. The full-sized Makeup Eraser retails for $20 at Sephora. It's made of polyester and, as per the included care instructions, can be washed with warm water and tumble dried, not unlike a lot of other face cloths. (In fact, they point out that you should wash this before your first use.) I've washed mine several times, just tossing it in with whatever non-delicates I had going, and have not had any problems with the the dye running or the texture changing. Speaking of texture! Each side has a different feel: one has shorter, terry-cloth-esque nubbins made to remove your makeup, the other has longer and softer fibers that apparently exfoliate. I dunno, the exfoliating side doesn't do anything for me, but I could be too used to chemical exfoliants at this point to notice a difference. 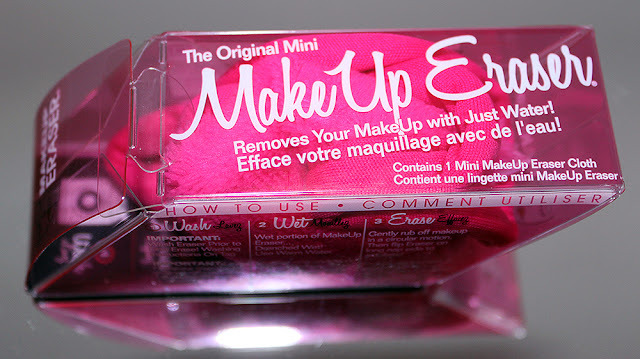 The mini Makeup Eraser I'm testing is of the same quality as the full-size, it's just smaller. I recorded the measurements as 2.5" wide and 7" long; I also compared it to a standard-size novel for my fellow visual learners. The full-size cloth is 7" wide and 16" long, which is comparable to the average hand towel. The Sephora page for the set this came in is loaded with complaints about how "tiny" this is, but frankly, I think that's silly. First, they outright state that the kit comes with a mini Makeup Eraser. Come on! Second, this smaller size is just right for one use, which is roughly how often I will use it per week. Third, the mini seems more suited to travel; I would gladly take this with me for a weekend trip. The benefit of the full-size cloth, apparently, is that you can use one section at a time, so you get more uses out of the towel before you have to wash it. I'm a neat freak, though, so I would have to wash it after every use, even if I only used one corner. If you don't have that problem, though, then you should be able to get 2-3 removals out of your full-sized Makeup Eraser before you toss it in the washer. The company promises that the towel will last for a thousand washes, so we should be in the clear regardless. Now, again, I would never feel comfortable relying on this to remove a full face of makeup. That's a very personal quirk: I like knowing that all of my foundation, lipstick, eyeliner, etc. is off of my face before I even touch my cleanser, and an oil-based remover gives me that safety net. Instead, I tested this product on one of my lazy days. On the left, you can see the makeup I was wearing on this particular day: Colourpop brow pencil, non-waterproof MAC In Extreme Dimension mascara, Kat Von D Lock-It concealer under my eyes and on a few spots, and some Glossier Balm Dot Com. As per the instructions, I soaked half of the Makeup Eraser in lukewarm water and very gently rubbed it around my eye area. Here's what my Makeup Eraser looked like after I removed everything. I'm gross, so the sight of that makeup satisfies some dark part of my soul. 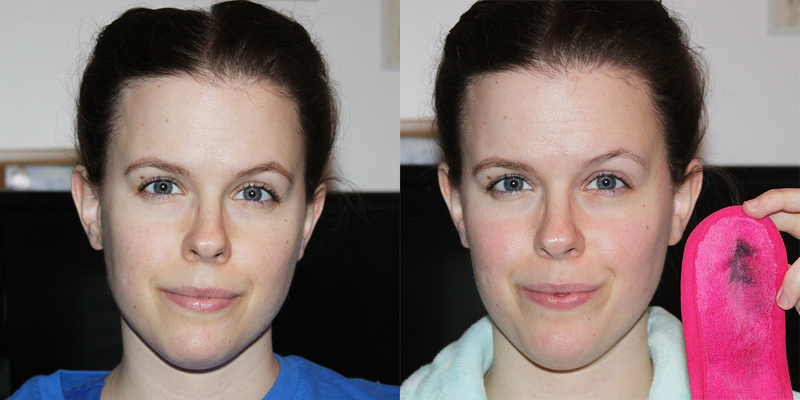 I will also note that my skin felt very normal afterward; it was not rough, red, or oily. Of course, I got in the shower afterward and followed up with my usual cleanser. Remember that this product is a makeup remover, not a cleanser; it will not clean your face. Now, the aforementioned makeup I wore was very light, and the Makeup Eraser's Sephora page promises it can do more: "Remove smear-proof, water-proof makeup and mascara." 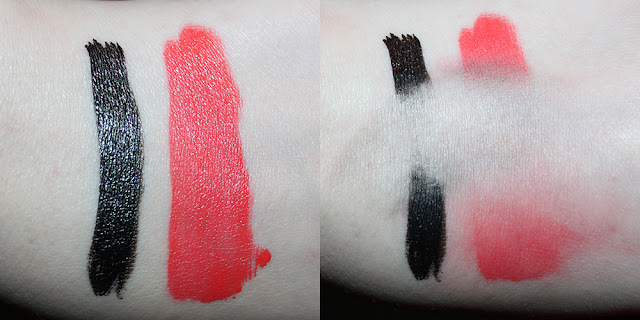 Hence, I decided to test it on a couple of very tenacious products, the Kat Von D Tattoo Liner in Trooper and a Lime Crime Velvetine. I applied some of each product to the back of my hand and let it sit until it was totally dry. Then I attempted to remove it with the Makeup Eraser. As you can see on the right, I was able to remove a good bit of the product. However, it doesn't break these products down as efficiently as an oil cleanser would. Also, I had to rub very hard and for a good 30 seconds to completely remove these products, which doesn't sit well with me personally. Initially, I intended to rate this a 4 out of 5 because it does not remove waterproof makeup without a decent amount of scrubbing. I realized, though, that that is a relatively minor complaint given how well it works on more "basic" makeup. Also, not everybody is as adverse to scrubbing as I am. Overall, the Makeup Eraser is easy to use, a breeze to clean, and a relatively affordable way to cut down on waste. While I hesitate to recommend it as a go-to makeup removal option for those who wear a lot of makeup on the regular, I have no qualms saying it is a solid product for the average user. I was wondering about the exfoliating side, so thanks for this review. 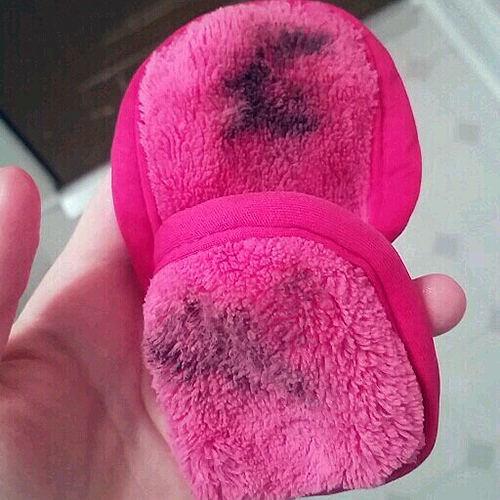 My sister has been using a microfiber cloth with just water to remove her makeup for about a decade. She is one of those lucky ones who has almost flawless skin without using any skincare (including cleanser!). Personally, I prefer face wipes. However for anyone who wants to try the Makeup Eraser, Sephora has a similar thing from their brand but theirs is a pack of two for $12. I never cared for wipes, to be honest; I felt like they didn't get my face clean and were wasteful. But this works strangely well for me on light makeup days. You can also buy microfibre wash cloths on Amazon (etc.) for about $5 for a whole pack, so you don't have to do laundry as often. 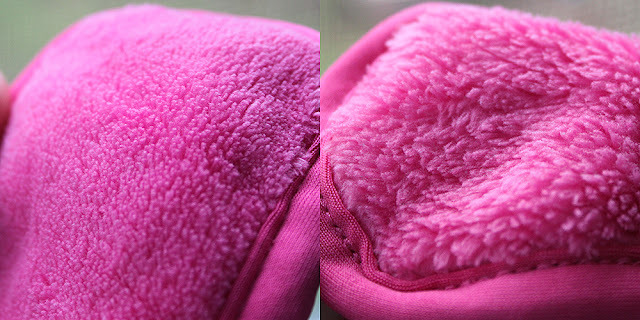 I've tried some other microfiber cloths and they didn't work as well for me as this one does. I know others have better results, though! No lies, I kinda had to talk myself in to trying it the first time. I'm so used to rubbing oil all over my face to remove makeup.